Hepatitis C virus (HCV) infection is the leading indicator for liver transplantation in Western countries. There is no vaccine available and current treatments are toxic and only partly effective. The most cost effective means of controlling infectious disease is through vaccination, however, a prophylactic or therapeutic vaccine for HCV is not available. Essential to the success of a HCV vaccine will be an ability to confer broad protection against seven circulating genotypes, (up to 33 percent nucleotide variation), comprising over 67 subtypes (up to 20 percent nucleotide variation). The effectiveness of all current licensed viral vaccines relies on the production of neutralising antibody (NAb). In the case of HCV, NAbs directed towards E2 are strongly correlated with viral clearance in naturally infected humans who clear their infection spontaneously. Consistent with these observations, broadly neutralising monoclonal or polyclonal NAbs (bNAbs) can protect against experimental HCV infection. These findings suggest that an ideal HCV vaccine will generate bNAbs directed towards E2. However, where the surface glycoproteins of HCV have been used as vaccines, the predominant specificity of elicited NAb is highly restricted to the same viral strain with limited ability to neutralise other genotypes of HCV. Image: HCV infected liver cells. 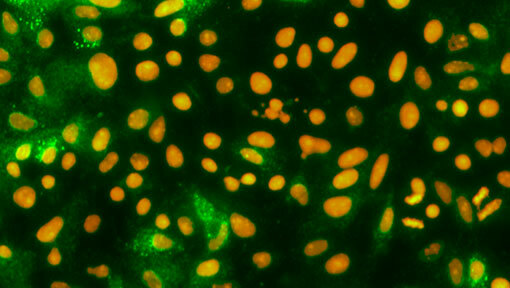 The cytoplasm of infected cells can be seen stained in green, nuclei are stained in orange. Three variable regions contribute to the ability of E2 to limit the production of bNAbs. Hypervariable region 1 (HVR1) at the beginning of E2 is immunodominant and generates large amounts of type-specific NAbs. Internally, E2 has two further variable regions, HVR2 and the igVR, which evolve during natural infection but are not targets of the antibody response. Removing all three variable regions enhances the ability of bNAbs to bind E2 and enhances their ability to prevent E2 binding to cell surface receptor CD81. Our findings suggest that an important function of HVR2 and the igVR is to shield the binding sites for bNAbs and the CD81 binding site. Researchers in the Viral Entry and Vaccines Laboratory led by Associate Professor Heidi Drummer have developed an HCV vaccine candidate wherein the three variable regions are deleted from a recombinant form of E2 (HepSeeVaxDelta3TM). The resulting protein is preferentially recognised by bNAbs and vaccination with HepSeeVaxDelta3TM generating larger amounts of bNAbs than conventional E2 vaccines. Importantly these bNAbs have been shown to prevent replication of all 7 genotypes of HCV in vitro. Image: Schematic of HepSeeVaxDelta3TM technology. PCT/AU2007/001221 ‘Recombinant HCV E2 Glycoprotein’ Drummer, HE, Poumbourios, P and McCaffrey K. Granted in Australia, USA, China, South Korea and Japan. Under examination in other jurisdictions. PCT/AU2011/001534 ‘Compositions and Methods’ Drummer, HE, Poumbourios, P and McCaffrey K. In national phase. Granted in Australia. Under examination in other jurisdictions. PCT/AU2011/000991 ‘Modified Hepatitis C Virus Proteins’ in National phase. Drummer, HE, Poumbourios, P and McCaffrey K. In national phase. Granted in USA. Under examination in other jurisdictions. The use of a prophylactic HCV vaccine in conjunction with DAA’s to prevent re-infection. HCV is estimated to chronically infect three percent of the world’s population causing 350 million deaths each year. Direct acting antivirals (DAAs) will be highly effective at curing HCV in people with known HCV infection. However, a vaccine will be required to prevent new infection and prevent reinfection in those treated with DAAs. A vaccine can support a DAA elimination program by reducing the required number of treatments per year by 23 for every 1000 PWID (90 percent vaccine efficacy, 50 percent initial prevalence of HCV). MCCAFFREY, K., BOO, I., POUMBOURIOS, P. & DRUMMER, H. E. 2007. Expression and characterization of a minimal hepatitis C virus glycoprotein E2 core domain that retains CD81 binding. J Virol, 81, 9584-90. MCCAFFREY, K., GOUKLANI, H., BOO, I., POUMBOURIOS, P. & DRUMMER, H. E. 2011. The variable regions of hepatitis C virus glycoprotein E2 have an essential structural role in glycoprotein assembly and virion infectivity. J Gen Virol, 92, 112-21. MCCAFFREY, K., BOO, I., TEWIEREK, K., EDMUNDS, M. L., POUMBOURIOS, P. & DRUMMER, H. E. 2012. The role of conserved cysteine residues in Hepatitis C virus glycoprotein E2 folding and function. J Virol, 86, 3961-3974. DRUMMER, H. E. 2014. Challenges to the development of vaccines to hepatitis C virus that elicit neutralizing antibodies. Front Microbiol, 5, 329. ALHAMMAD, Y., GU, J., BOO, I., HARRISON, D., MCCAFFREY, K., VIETHEER, P. T., EDWARDS, S., QUINN, C., COULIBALY, F., POUMBOURIOS, P. & DRUMMER, H. E. 2015. Monoclonal Antibodies Directed toward the Hepatitis C Virus Glycoprotein E2 Detect Antigenic Differences Modulated by the N-Terminal Hypervariable Region 1 (HVR1), HVR2, and Intergenotypic Variable Region. J Virol, 89, 12245-61. ALHAMMAD, Y. M., MAHARAJH, S., BUTCHER, R., EDEN, J. S., WHITE, P. A., POUMBOURIOS, P. & DRUMMER, H. E. 2015. Longitudinal Sequence and Functional Evolution within Glycoprotein E2 in Hepatitis C Virus Genotype 3a Infection. PLoS One, 10, e0126397. DRUMMER, H. E. 2015. Editorial on “Broadly neutralizing antibodies abrogate established hepatitis C virus infection” published in Science Translational Medicine on 17th September 2014. Ann Transl Med, 3, S6. SCOTT, N., MCBRYDE, E., VICKERMAN, P., MARTIN, N. K., STONE, J., DRUMMER, H. & HELLARD, M. 2015. The role of a hepatitis C virus vaccine: modelling the benefits alongside direct-acting antiviral treatments. BMC Med, 13, 198. FAFI-KREMER, S., FAUVELLE, C., FELMLEE, D. J., ZEISEL, M. B., LEPILLER, Q., FOFANA, I., HEYDMANN, L., STOLL-KELLER, F. & BAUMERT, T. F. 2012. Neutralizing antibodies and pathogenesis of hepatitis C virus infection. Viruses, 4, 2016-30. MORIN, T. J., BROERING, T. J., LEAV, B. A., BLAIR, B. M., ROWLEY, K. J., BOUCHER, E. N., WANG, Y., CHESLOCK, P. S., KNAUBER, M., OLSEN, D. B., LUDMERER, S. W., SZABO, G., FINBERG, R. W., PURCELL, R. H., LANFORD, R. E., AMBROSINO, D. M., MOLRINE, D. C. & BABCOCK, G. J. 2012. Human Monoclonal Antibody HCV1 Effectively Prevents and Treats HCV Infection in Chimpanzees. PLoS Pathog, 8, e1002895. VANWOLLEGHEM, T., BUKH, J., MEULEMAN, P., DESOMBERE, I., MEUNIER, J. C., ALTER, H., PURCELL, R. H. & LEROUX-ROELS, G. 2008. Polyclonal immunoglobulins from a chronic hepatitis C virus patient protect human liver-chimeric mice from infection with a homologous hepatitis C virus strain. Hepatology, 47, 1846-55. LAW, M., MARUYAMA, T., LEWIS, J., GIANG, E., TARR, A. W., STAMATAKI, Z., GASTAMINZA, P., CHISARI, F. V., JONES, I. M., FOX, R. I., BALL, J. K., MCKEATING, J. A., KNETEMAN, N. M. & BURTON, D. R. 2008. Broadly neutralizing antibodies protect against hepatitis C virus quasispecies challenge. Nat Med, 14, 25-7. HOUGHTON, M. & ABRIGNANI, S. 2005. Prospects for a vaccine against the hepatitis C virus. Nature, 436, 961-6. DE JONG, Y. P., DORNER, M., MOMMERSTEEG, M. C., XIAO, J. W., BALAZS, A. B., ROBBINS, J. B., WINER, B. Y., GERGES, S., VEGA, K., LABITT, R. N., DONOVAN, B. M., GIANG, E., KRISHNAN, A., CHIRIBOGA, L., CHARLTON, M. R., BURTON, D. R., BALTIMORE, D., LAW, M., RICE, C. M. & PLOSS, A. 2014. Broadly neutralizing antibodies abrogate established hepatitis C virus infection. Sci Transl Med, 6, 254ra129.